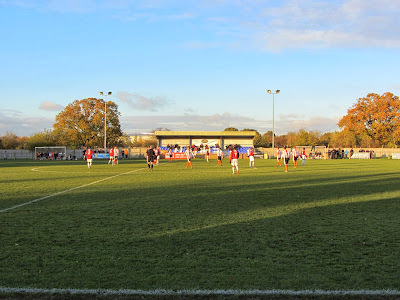 My twenty-sixth stadium of 2013 was on Saturday 23rd November at the Robert Parker Stadium in Stanwell, Surrey. The match was Ashford Town (Middlesex) vs. Potters Bar Town in the Southern League Division One Central. 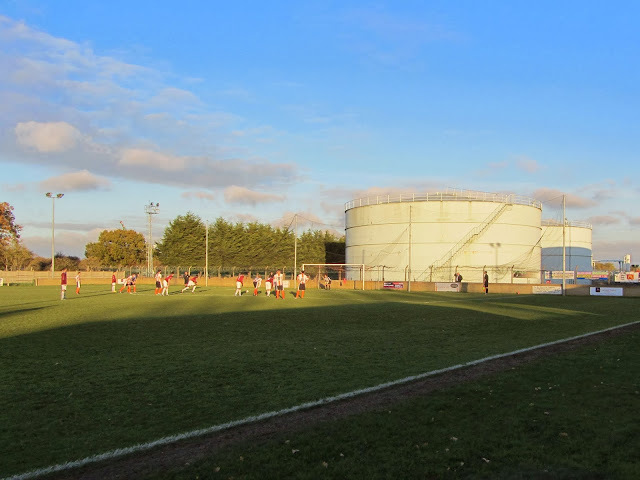 The Robert Parker Stadium sits in the shadow of Heathrow Airport which lies half a mile north of the venue. The ground is surrounded by fields to the north, an oil depot to the east, football pitches to the south and housing to the west. It is just under 2 miles from Ashford (Surrey) railway station and 2.5 miles from Hatton Cross tube station on the Piccadilly Line. The venue has been home to the club since 1986. The south of the ground contains a couple of stands - a long, thin 100-seat structure is located towards the eastern end of the venue with a small covered terrace section around the half-way line. The other half of this side of the ground is uncovered standing. In the south-east corner there is a food outlet and with the clubhouse sitting just outside of the main entrance. If viewing from the south of the venue you can see the planes coming and going from Heathrow Airport. On the northern side of the ground there is a 150-seat stand which sits by the half-way line. The dugouts are located in front of this to either side of the stand. The rest of the ground is uncovered standing though space is constrained behind both goals due to the close surroundings of the venue. Ashford Town went into this game on the back of ten game losing streak which had cost the manager his job a few days earlier. Any hopes of stopping the rot took a blow after two minutes when home defender Jim Mann received a red card for kicking Tobi Akin in the penalty area. Akin got up to take the penalty and though it was saved by Tyler Tobin it was going to be a long afternoon for Ashford who were left to play the remaining 88 minutes with ten men. Having missed the penalty it took the visitors until the 36th minute to breakthrough the Ashford defence - Tobi Akin played the ball through to Cole Penny and he poked the ball past the advancing goalkeeper from 12 yards. With Ashford going into the interval only 1-0 behind they were still in the game but they frustrated themselves immediately after the restart by conceding again. Just over a minute after the kick-off when Cole Penny laid the ball off to James Ewington who finished from close range. In the 64th minute the second red card of the game was produced - with Potters Bar being reduced to ten men. Finbar Roberts had picked up a needless booking in the first half for kicking the ball away and when he launched into a robust tackle near the centre circle the referee showed him his second yellow of the game. Ashford had a little more of the ball after this though the game was summed up for them when substitute Cyril Ocansey missed the chance for a consolation from close range.The game finished 2-0 to the visitors to consign the home side to an 11th consecutive defeat.